First, for the past few days I've been posting infographics from the Guttmacher Institute. I love infographics. They pack in so much information in an easy-to-consume format. They really could act as a FAQ on their own, which is why they were posted without comment. I know I get asked those questions a lot. Yes, I said so-called feminist mom. I do not believe everyone should have abortions, but I do believe with every inch of me, including the cells of my daughter that will float inside me forever, that I do not get to make reproductive decision for others. Moreover, that includes my daughter. She is only nine, but every time I notice that she is getting just a smidgen taller, older and yes, more woman-like, my feminism strengthens. My adherence to supporting full reproductive choices for every woman in the USA and around the world becomes more rabid. For the past eight years most of my activism has revolved around raising money for the Chicago Abortion Fund in order to assist the girls and women who call the hotline a chance to make their own decision. The thought that anyone could decide when and if my daughter becomes a mother infuriates me to no end. Therefore, yes, becoming a mother has changed my feminism. It has made me more radical and adamant to ensure that she can make her own decisions when the time comes. I pray to all the gods that she will come to me for advice, but I know there is a chance she will not. I fight for reproductive justice for not just my daughter, but also everyone out there. VLF -- I did edit the last line to be more inclusive than just daughters. 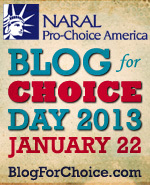 I'll end with some of my favorite books about reproductive choice and reproductive justice. Please leave your favorite books in the comments! I'm going to quote a friend's review for this book, "I hate when people say the pro choice movement is made up of white, middle class women. Mostly because it is, but also because non privileged women have been fighting for within the reproductive justice movement, not the pro choice movement. Confused? Read this book and it'll clear it all up." You can read my review of this intriguing book and my interview with Merle. Because being a mom should be by choice. You can read my review "Motherhood and Feminism." I had to include this because it is haunting my thoughts. I read it last last year and it is a doozy. The premise is that sometime in the future pro-choice and pro-life forces have come to a compromise...an awful compromise...where all pregnancies must be carried out, but you have until age 16 to decide if you want to "abort" your child through unwinding, a procedure that harvests every piece of the human body in order to use it for others. I wouldn't say it is pro- or anti- abortion, rather a fairly good piece of fiction that makes you think, "WOW, I did NOT think this debate could be more fucked up." I can relate to this so very much: "Therefore, yes, becoming a mother has changed my feminism. It has made me more radical and adamant to ensure that she can make her own decisions when the time comes." Having a child changed me this way too. I especially liked your inclusion of the book "Unwind." It is a YA book, but like you it has haunted me a lot since reading it last year. I have recommended it many times, both for the subject matter and the strong female character. Thank you for reading and for leaving a comment! Glad to know "Unwind" is haunting others.